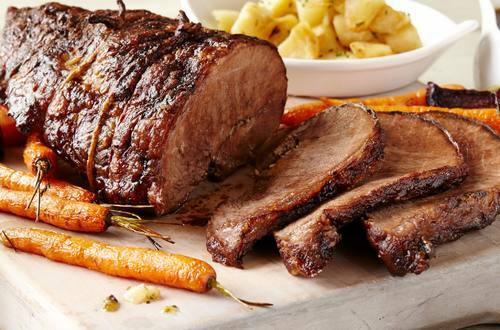 A juicy beef brisket recipe is packed with taste. The beef is rubbed with Hellmann's® or Best Foods® Real Mayonnaise and cooked in stout beer to release the great meat flavor. 2 Heat oil in large Dutch oven or oven-proof deep skillet over medium-high heat and brown beef on all sides. Remove beef from Dutch oven and set aside. 3 Melt Country Crock® Spread in same Dutch oven and cook onion, celery and carrots over medium heat, stirring occasionally, until crisp-tender, about 5 minutes. Stir in brown sugar and beer and bring to a boil, stirring occasionally. Remove from heat. 4 Combine Hellmann's® or Best Foods® Real Mayonnaise with mustard; rub onto beef. Arrange beef on vegetables in Dutch oven. 5 Bake covered until beef is very easily pierced with a fork, about 3 hours. Remove beef and let stand before slicing, about 10 minutes. Serve, if desired, with roasted potatoes and roasted vegetables.